This buns are just perfect! There is nothing more to say about this velvety dough and sensational French brioche texture! The original recipe is from Falling Cloudberries: A World of Family Recipes , by Tessa Kiros: I recommend this book to anyone interested in real, down to hearth, simple and satisfying recipes! I’ve tried many and none was a disappointment, from a potato salad to the ultimate roasted chicken. And those buns! Even the making of them is so satisfying I could make them everyday! Jam (I’ve used my father in law figs and honey jam: whole figs cooked in sugar and honey. 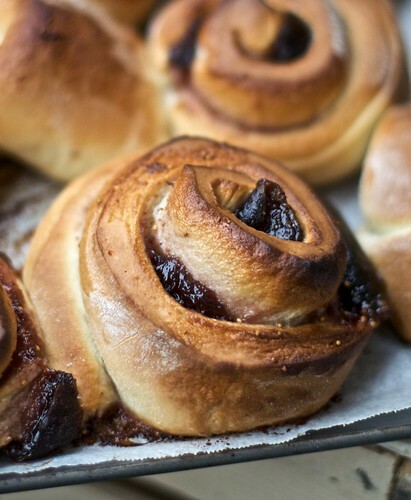 The original recipe calls for cinnamon butter, but I do pefer them with jam). I think next time I try to add fresh fruits, like berries or sliced apples, to the filling. I normally make the dough in my Kenwood Chef: easier, faster, no fuss. But you can make it by hand (brave!). Crumble the yeast in the milk with the sugar and let it bubble. Add the egg, butter, cardamom and salt. Mix. Add the flour, mixing with a fork, then by hand. Knead by hand until the dough is silky and smooth. Cover with a clean dump cloth and let it rise in a warm place for at least 2 hours on until it doubled the size. On a floured surface, roll out the dough 2-3 millimetres thick. Spread the jam and beginning for the larger side, roll it up to make a big sausage. Cut the sausage in 3 centimetres thick slices. Lay them, cut side up, on a tray covered with oven-proof paper, 2-3 centimetres far from one another. Let it rise. When the oven is hot, bake the buns for 15 minutes or until golden. Let them cool, if you can resist!